Before we completely move into the Christmas season (ummmm what about Thanksgiving?? ), I wanted to share this year's Halloween costume! You might remember a few years ago, Jeremy and I participated in the Olive Branch YMCA's Trunk or Treat as Harry Potter and Hermione. 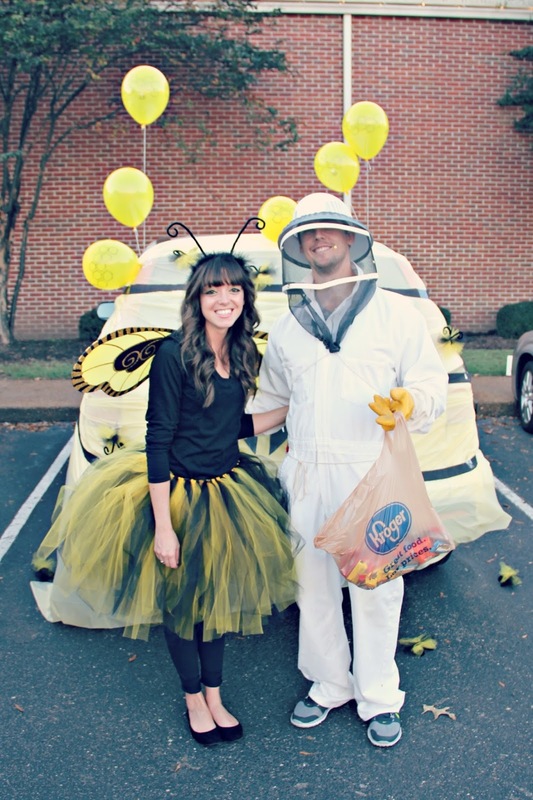 This year, we went as a beekeeper and a bee. I gotta say, it was pretty great. Since we had access to an authentic beekeeper suit -- my father-in-law is a beekeeper! -- I thought this idea was perfect for us. It was easy to execute and cost very little. Jeremy wore his Dad's suit, and we stuck little bees that I found at a craft store all over his headgear. The kids kept asking if they were real bees. Too cute! For my bee costume I wore black shoes, black yoga pants, and a black shirt that I already had. I put together a tulle skirt using black and yellow tulle which was crazy easy to do. There are about a million and a half tutorials on Pinterest. I made my antennas from craft supplies. The only thing I bought were the wings. I was going to attempt to make them, but I found a good deal, and figured they would totally make the outfit. They did! 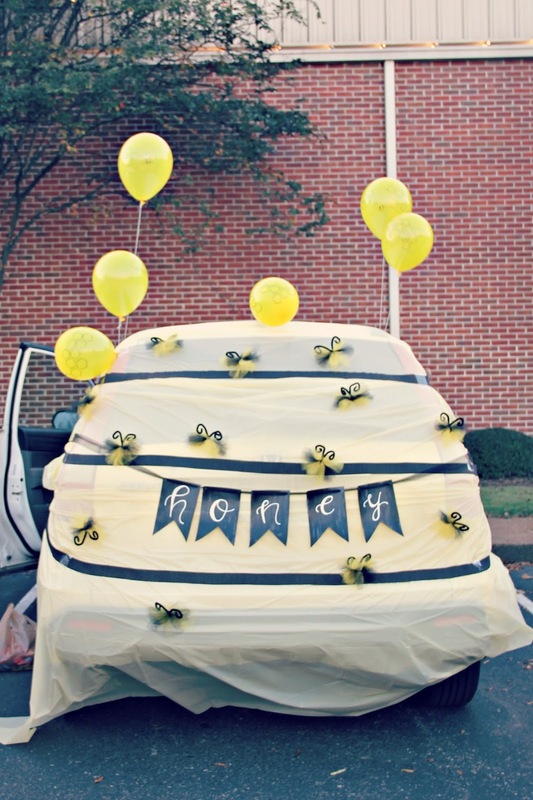 Luckily, the weather participated this year and we were able to actually decorate our car... like a beehive. It was extremely simple. We used plastic yellow tablecloths from the dollar store to wrap the trunk. The stripes were black streamers, also from the dollar store. We blew up some yellow balloons from, you guessed it, the dollar store and drew hexagons and bees on them. The "honey" sign I made using paper I had at the house, and the little bees were made using extra tulle from my skirt! We were one of the only cars at this particular Trunk or Treat that didn't do something traditionally Halloween -y and scary. Halloween doesn't have to be about ghosts, goblins, and spiders. You can do cute things, too! What did you dress up as this year?? Leave links if you blogged about it! You guys are adorable! What a great idea, especially with the car!!! This is adorable! I love the hive! I made life super easy for myself this year and was Wednesday Addams. All I had to do was braid my hair and throw on a black dress!